A copy each of Orders No. (i) 1/13(7)/2017-LS.II, (ii) 1/l3/(6)/2017-LS.II, (iii) 1/13/(5)2017-LS.II, (iv) 1/13/(4)/2017-LS.II (v) 1/13/(3)2017-LS.II and (vi) 1/13(1)/2017-LS-II dated 06.10.2017 revising the rates of variable dearness allowance for contract workers engaged in (i) Loading and unloading in goods sheds, parcel offices of Railways, and other goods - sheds, godowns, warehouses and other similar employments (ii) Watch and Ward (Without arms) (iii) Employment of sweeping and cleaning excluding activities prohibited under the Employment of Manual Scavengers and Construction of Dry Latrines (Prohibition) Act, 1993 (iv) Stone mines (v) Construction or Maintenance of Roads or runways or in Building Operations including Laying Down Underground electric, wireless, Radio, Television, Telephone, Telegraph and Overseas Communication Cables and Similar other Underground cabling work, Electric lines, Water supply lines and Sewerage Pipe Lines and (vi) Agriculture respectively is sent herewith for information and strict compliance. The rates are applicable w.e.f. 01.10.2017. Railway Board Order RBE No. 178/2017 No. 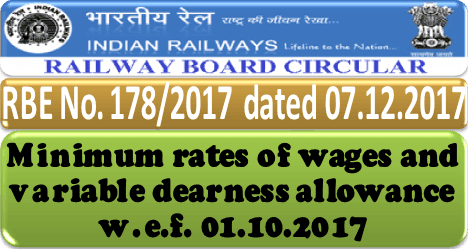 2016/E (LL)/AT/MW/1 dated: 07.12.2017 Sub: Minimum rates of wages and variable dearness allowance w.e.f. 01.10.2017.